Welcome to Day #2 of Cookies with Chocolate Theme Week. 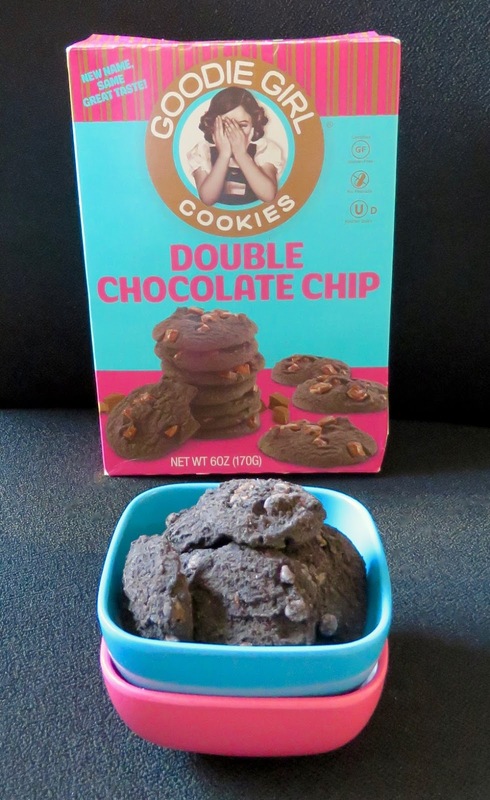 Today's Double Chocolate Chip Goodie Girl Cookies were from Goodie Girl Tribeca, LLC (Ridgefield, NJ). These small, ebony-colored chocolate, chocolate chip cookies had a soft crunch and a sweet, chocolatey flavor. Like all cookies featured on this site, these were gluten free. The texture may (or may not) be different, depending on the recipe, style of cookie and ingredients used. For example, some find rice flour cookies somewhat mealy and crumbly. However, when used in small quantities in, e.g. a florentine, or with crunchy oats and quinoa cookies, a touch of this flour (perhaps as part of a gluten-free flour blend) might work well.